The rumo rs are TRUE. Om ar sent a crew in and cleared the lot in 2 days. During the first week, the crew has dug 3 wells looking for potable water. They hit water with the first well only about 6 feet down, but the water was salty. The 2nd well, the same. The third time was a charm and we hit water about 6 feet down and on the beach end of the land. Sending samples out to be tested to make sure we can use the water to mix concrete. Omar’s crew erected a 12′ X 16′ bodega which we’ll use as a tool warehouse. 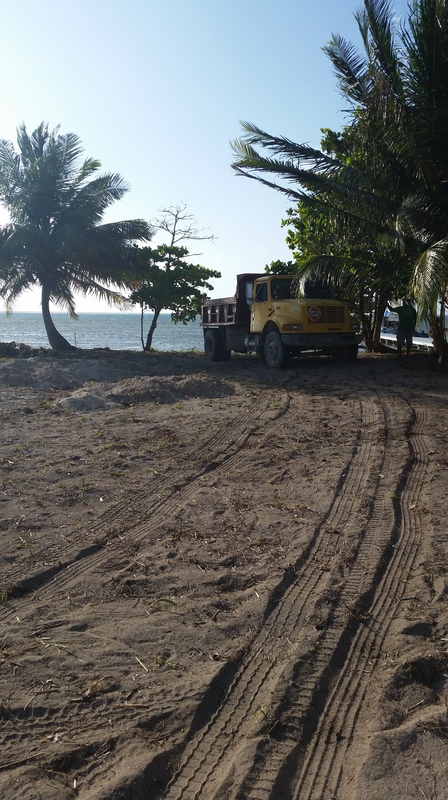 It will also serve as the temporary home for one of Omar’s trusted employees – Victor – who lives in Corozal, about an hour and a half ferry ride to the West. Victor will travel back and forth on the weekends but will also provide security at night. foundation AND for landscaping. A lot of it is black dirt, which is like gold on the island. We moved about 22 dump trucks of black earth and sand from the lot! You can grow “anything” with black dirt here and it’s in very high demand. Definitely an added bonus that came with the lot. Week 2 started off with forming up for pilings which will be sunk to rock and will be the base for the foundation. The pilings are made out of re-bar which is steel of varying thickness used to reinforce the concrete casing. We’ll be using a lot of steel in this house and it is critical that it is buried deep into the concrete so that salt air cannot damage the steel with rust. Also very important when it comes to things like hurricanes! The steel and concrete is tied together so that the entire foundation will be one giant structure under the building. By the end of week 2, they had poured 30 pilings and started tying re-bar together for the piling caps – massive 46″W X 46″D X 36″H steel and concrete blocks. The crew has also dug the initial holes for 15 of the pilings. Once the pilings are in the holes, water pressure will be used at the bottom of the piling and its own weight will sink it to rock. In most places, the rock is only a few feet down from the bottom of the holes – but we can hit a conch shell that would seem like rock. We’re very impressed with Omar’s crew. It’s obvious that these guys know what they are doing, have worked together for a long time and have a great work ethic. They show up on time (7:00 am) and work hard all day. They each have a role, but they jump in to help each other in a flash. This is the core of the team and will work through the end of the job. Other guys will be joining us soon, but these first 6 guys, will be there throughout the project. Sincerely, we could not be happier with the quality of guys on board. The crew is Alfonso (Patch) aka Jefe (he’s in charge when Omar’s not around), Victor (Pinky), Erwin (Canacito), Walter (Jinx), Santos (Mex) and Marco (still figuring out his nickname). In the mean time, Laura and I took care of getting the engineering stamps on the plans, checking up on the application and paying the square footage fees required by the Town Board to get the coveted building permit sign. The sign is displayed at the site so that any official driving by can easily see that we have the proper permits. It seemed to take a long time to get going, but it’s sure flying now! I (Mike) also took a few minutes to eat! Had breakfast with the crew one day which was a ham and cheese tortilla and a bag of icy cold horchata. Hmmm Hmmm good! We’d love to hear from you so don’t hesitate to let us know what you think or if you’d like to see more or less of something. We love reading the comments and suggestions! WOW! Now that is some progress!!! More everything, I love the updates, details, pictures and probably best of the human touch … Nick names, sharing breakfast, etc. Can’t get enough so keep them coming! I hope you guys are doing well! It’s been great so far, Mike! Lots of progress being made every day. Stay tuned and plan a vaca. right on schedule as of today…GREAT crew. We’ll be around Columbus around the first of June. Would love to have a drink and catch up…or you could come down here for some catch up!!! Let’s plan to do both! Let me know details when know for your visit. Yes, very exciting times for us. Wish you guys were here! You guys are doing a remarkable job! I’m so proud of the progress you’ve made! It looks so beautiful there!